What if you could have your life over again. Tully becomes a hostage when she is abducted from a chemist on Christmas Eve. Her ordeal lasts 24 hours. Like the cover - where the world is flipped upside down - nothing in Hostage is as it seems. It begins with Tully being taken Hostage by a boy from her school during a chemist scene gone wrong. From there - you witness Tully's life and childhood, what really happened while she was hostage in the car and also what's happening in the interrogation room at the Police Station. It's not a story of terror, outwitting and escape. It's an unexpected story of one girls life - where she is and how she got there and where she is headed. It's addictive and unassuming and probably not at all what you think it will be. Which makes it a compelling and stunning read. Told in snazzy, strangely addictive, bite-sized chapters, it seamlessly zooms backwards and forwards in time. It has a languid pace, where you slip into the story but with an undercurrent of urgency that keeps the pages flipping and flying past. Using a clear, fresh prose, atmosphere is evoked that draws you in and keeps you in the scene. The dialogue is straight up - adding authenticity and a layer of depth and soul to the characters. The characters are stark, whittled down throughout the book - exposing their fears and flaws, hopes and strengths,secrets and dreams - successfully burrowing their way into your heart. And then - when I was least expecting it - Tully shares a story - and I learnt about Sasha - and, mate, I felt such an ache. It's tear jerking stuff. It's powerful. I love that a story of sorrow and abandonment and love and wishes is set against Christmas and Christmas Eve - it's a perfect juxtaposition. This book has layers you can keep peeling back and seeing just how masterfully crafted and imagined it is. ...speaking of the last page. Argh, I missed some clues! It's a bit of a doozy and I so need to go back and figure out exactly what the final memory means. Did I mention that there's twists and turns and clues and stuff? It really kept me guessing - love that! I really liked this one, hey :) It's currently available in Australia. This book sounds extremely interesting! The story sort of reminded me of I'd Know You Anywhere by Laura Lippman. 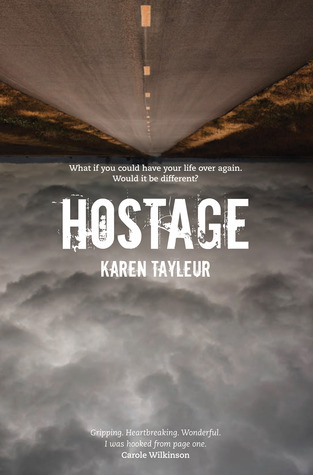 I am adding Hostage to my TBR. Ooh! I had a feeling I'd love this one after reading Six, and your review has totally convinced me. Must get my hands on hostage. And how cool is that cover with everything inverted? Very cool. Very, very cool. Very cool. And, it's now on my wishlist. Thanks for the recommendation! Another awesome review. I like the sound of the plot. It sounds layered and well thought out. I've never heard of this one - probably because I'm not in Aussieland, but it sounds incredible! Great review, Nomes! Another new title to add to my huge wish list. I can always count on you to find me yet another book that I must read. Love the new look too. ohhh this one does sound good! And I love when the chapters are short, somehow it makes me feel like I'm reading faster and I keep telling myself since they're short I'll read just one more until I realize I'm at the end:) Love twists and turns as well, so I'm definitely going to add this one to my list. Really great review! I haven't heard of this one before, thanks for the review - this will be going on my TBR list. I am DYING to read this now. DYING. sounds incredible. i might buy it to read on plane to england. i remember looking at it ages ago. and just never bought it (for reasons unknown). ...definitely buying territory now. thanks nomes!